In 2019 I want to paint more regularly. Last year I found I wasn’t interested a lot of the time and because I don’t get a lot of time to paint, it’s important that I take advantage of what I can do. My goal this year is to paint weekly on Friday nights. I will start the year by painting small paintings that are not that different from my daily drawings and I hope to complete a few larger canvases as well. In the last few months, I have been painting smaller items. 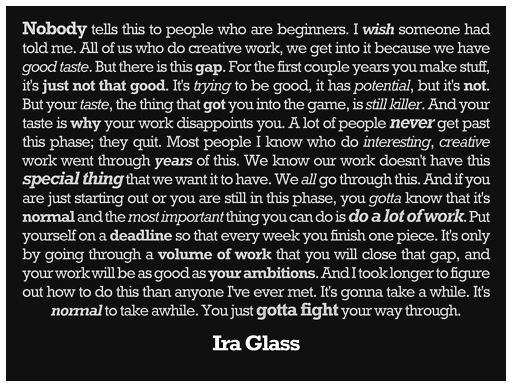 The good part is that they are finished quickly so if they are mediocre, at least the time investment was small. And sometimes they turn out not too badly. I’ve also started painting small abstract pieces to finish the evening. The images above are a mix of what has come out of my recent painting sessions. Another month past and another 28 drawings completed. I think February went better than January. And now it’s March – the weather is warming up and spring is in the air. I hope to be a little more experimental again this month and loosen up a bit. In January and February I worked at 5”x7” and for March I’ve prepared a lot of paper at 8”x10”. I’ve added a few new papers to play with and plan to try working more with both vine and compressed charcoal. And maybe some paint… We’ll see how it goes. It’s been awhile since I posted sketchbook drawings, so here are my favourites from the end of last year. These are the drawings I do before my daily drawing as a warm up and they are often more experimental – and sometimes I end up with something I’m proud of and want to offer up to be seen. Each day I started with about a half hour of drawing, often of the same subject that I would then paint. I found this very helpful to get a feel for the values of the subject matter with graphite or charcoal prior to taking on the paint. I began most of the paintings with a very quick charcoal sketch directly on the panel. I spent between one hour and an hour and a half painting each panel. 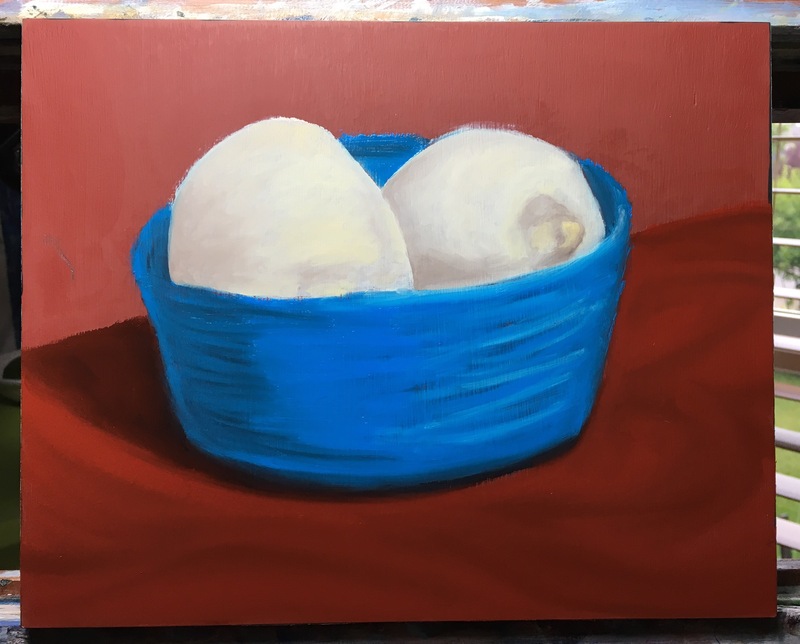 I painted with two spot lights – one directed to my subject matter and one to my easel and kept the blinds closed in order to control the light. I played a lot with outlines which flatten the image, but then adding volume into the objects themselves with gradated values. Trying to keep the edges sharp was tedious with oil paint and my lines became very inconsistent as a result, which annoyed me. Distinct outlines also created issues regarding shadows and light reflected off the edges of objects and how to portray that in a simplified manner. On Day Fourteen, I decided to soften all of my edges – with a favourable outcome. I should have known better and not cut the a lemon off on two sides on Day Seven. There was no way I was going to be able to make that lemon 3 dimensional after that. And I completely forgot to add the shadow under the bowl. I really need to avoid outlining round objects until I learn to draw a better circle. This was a problem in Day Seven and again on Day Thirteen. My lights were quite bright and the room fairly dark, which sometimes resulted in a fairly dark painting, as in Day Nine. 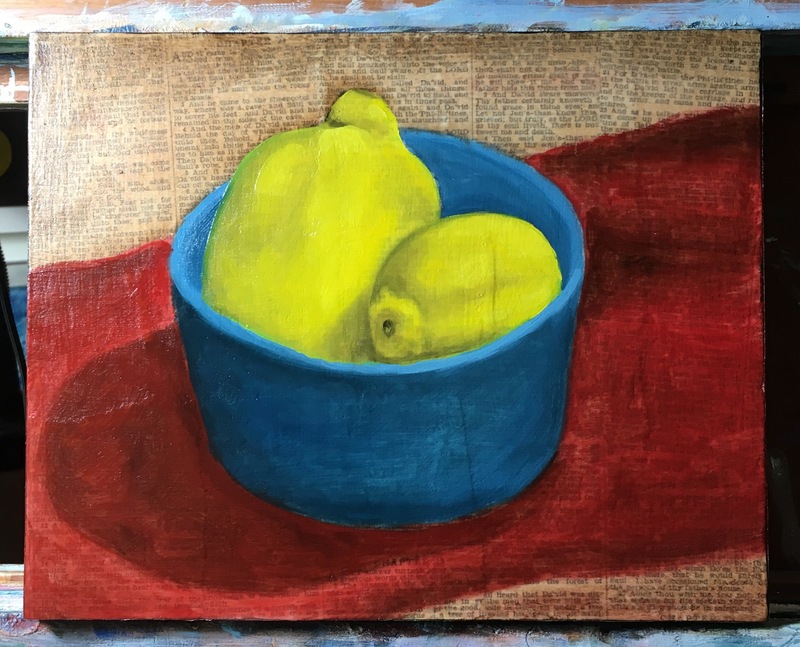 On Day Twelve I roughed in a few colours onto the pears and was about to start blending them in and then decided I liked it how it was and I just stopped. Prussian blue is one of my favourite colours and it turned up in eight of the paintings and the combination of Prussian blue and burnt umber appeared in six of them. The last 3 days I used all of the same colours. The biggest gain I achieved from this project was developing an increased ease at just jumping in and starting and not thinking about how it’s all going to turn out – and that has made it well worth the effort. I needed a change, so I played with oil sticks today and came up with these ghost lemons. With only 5 colours to choose from (including a very pale yellow), I might have considered a different subject – but I didn’t. 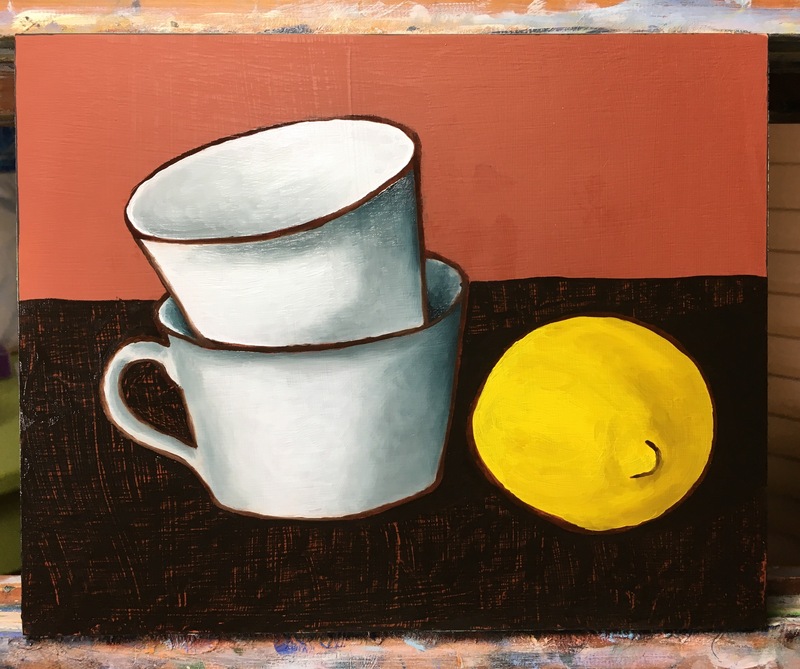 Cups and a lemon. Because I’m Canadian and have a need to state the obvious.